We hear of helmet-to-helmet contacts often in the NFL and blame these blows for the concussions player suffer. But is that the most common mechanism of head injuries in football? In a study of concussions occurring In the NFL between the 2010-2011 and 2013-2014 seasons, Michael D. Clark and others analyzed the video of 429 of the 871 total concussions diagnosed over those seasons. They analyzed the plays during which each injury occurred for the location on the field, closing distance, type of impact, whether the players appeared to anticipate the impact and more. What types of impacts caused concussions? In terms of impact, the researchers wanted to determine whether blows were helmet-to-helmet, helmet-to-ground, helmet-to-pads or body. They used video to determine the player’s anticipation based on whether the player seem to be in a prepared position, such as facing the oncoming player and lowering his head and shoulder. • A higher percentage of concussions occurred during the second half compared to the first half in NFL games. A significantly higher percentage occurred in the fourth quarter than the other quarters of the game. • A majority of concussed players appeared to anticipate the blow – 57%. • A majority of injuries occurred from impacts with closing distance between the players of less than 10 yards, although closing distance seemed have no correlation with anticipation of the impact. • Helmet-to-helmet contacts were not the most common impact type. The blows were fairly evenly distributed between helmet-to-body, helmet-to-helmet, and helmet-to-ground. It’s possible that targeting rules, where players delivering intentional blows to the head are penalized, could be helping. In the past, 61% of concussions in the NFL resulted from helmet-to-helmet blows. Now only 32.4% are. Anticipation of the collision and preparing for it don’t seem to help much. 57% of players appeared to be in good position, expecting the collision, and yet they still suffered a concussion. It’s possible that in these situations, such as a kickoff return, the magnitude of the blow is high enough to cause an injury. Finally, it’s hard to know if this data would be found at the high school or youth football levels. In a study of concussions in high school sports, 70.7% percent of concussions were caused by helmet-to-helmet blows. In a study of youth football, 45% occurred from helmet-to-helmet contact. 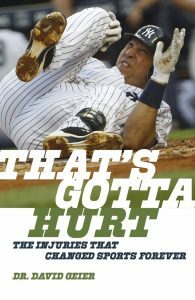 I’ve written about the concussion and brain injury challenge facing football in my new book, That’s Gotta Hurt: The Injuries That Changed Sports Forever. Read the opinions of brain experts, and decide for yourself where the sport and young athletes are heading.Order your copy now from Amazon, Barnes and Noble, Books-A-Million, or Powell’s Books. Clark MD, Asken BM, Marshall SW, Guskiewicz KM. Descriptive Characteristics of Concussions in National Football League Games, 2010-2011 to 2013-2014. Am J Sports Med. Published online ahead of print.